RON Mack Machinery , Australia's premier supplier of specialist metalwork machinery, will display the Goodway GA-330L CNC turning centre. Goodway is one of Taiwan's largest manufacturers of CNC lathes, producing in excess of 700 lathes annually. 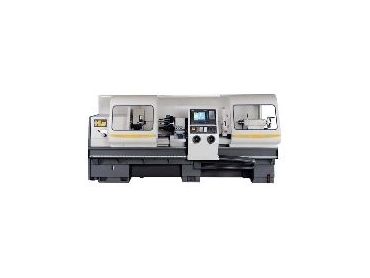 The GA-330L features a swing of 600mm, a maximum turning diameter of 500mm, a turning length of 1200mm, a 12-inch Kitagawa chuck, 90mm bar capacity and 30 hp spindle motor. The GA-330L has a Siemens conversational controller with Shopturn. Also on display at Austech will be the Australian-made Scalen 970FX. The 970FX leads the hydraulic press brake market with technological advances including the Delem control panel featuring a Windows based operating environment. The Scalen 970FX features powerful networking functions, high-speed operation allowing greater productivity and improved performance, and advanced design ensuring a hydraulically stable and rigid machine. Another highlight will be the Mitseiki vertical machining centres. Mitseiki offer versatile heavy duty vertical machining centres that are recognised for their substantial power and large travels. The machines comprise solid four box way construction for heavy-duty cutting and an integrated chip auger allowing no fuss swarf removal. Other machines featured on the Ron Mack Machinery stand include a FAT TUR MN 560mm x 2000mm CNC lathe, with eight-station turret, 25HP motor, a 105mm spindle bore, and Ficep hydraulic punch and shear machines. Ron Mack Machinery is at stand G60 in the Austech Pavilion at National Manufacturing Week 2005, in Melbourne, May 10-13.